To accomplish its mission, a satellite or spacecraft must keep to a very specific trajectory. First, it has to reach that trajectory and stay there. It also has to remain pointed in a certain direction with respect to the Earth and Sun. It is this attitude that ensures it gets sufficient solar energy, can acquire images in the right illumination conditions and can communicate with Earth. But while theory dictates that a satellite should sustain a perpetual and undisturbed trajectory, the reality is altogether different. Once on station, a satellite does not stay there indefinitely without outside help. The reason is that it is subjected to disturbing forces that gradually brake or accelerate its motion on each orbital revolution. Space exploration therefore involves much more than just designing and launching spacecraft. We also have to work with the laws imposed by space, and find solutions to control our space assets remotely and keep them on the right track. The Earth is not a perfect sphere and its mass is not uniformly distributed. It is flattened at the poles and bulges at the equator, which causes the gravity field to vary by as much as 1/1000 of its main attractive force. The vacuum of space is not complete. In the vicinity of Earth, there is a residual atmosphere that increases in density the nearer we get to the planet. Up to an altitude of at least 1,000 km, satellites are subjected to braking due to drag caused by molecules and atoms. For example, a satellite at 800 km above Earth can remain in orbit for half a century, whereas at 300 km it would fall back into the atmosphere after a few months, and at 200 km within days. Satellites are also subjected to the attraction of the Moon and Sun. The Sun emits photons that, to a lesser extent, can perturb a satellite’s motion. As a result, a satellite’s natural orbit is not a perfect ellipse and has to be corrected regularly by manoeuvres. An unperturbed orbit is called a Keplerian orbit, after the German astronomer Johannes Kepler. A Keplerian orbit describes the trajectory of a body around a star affected only by mutual gravitational attraction. Kepler derived three laws describing planetary motion around the Sun. Other kinds of orbital manoeuvres may also be necessary, for example when two spacecraft need to rendezvous in orbit on crewed missions, to resupply a space station or repair a satellite. Atmospheric re-entry and the return to Earth of astronauts or experimental systems also have to be carefully controlled. 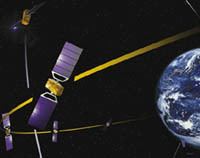 Satellites, probes and crewed spacecraft are tracked continuously to determine their precise trajectory. When they deviate too far from their nominal orbit, commands are sent to correct this trajectory. 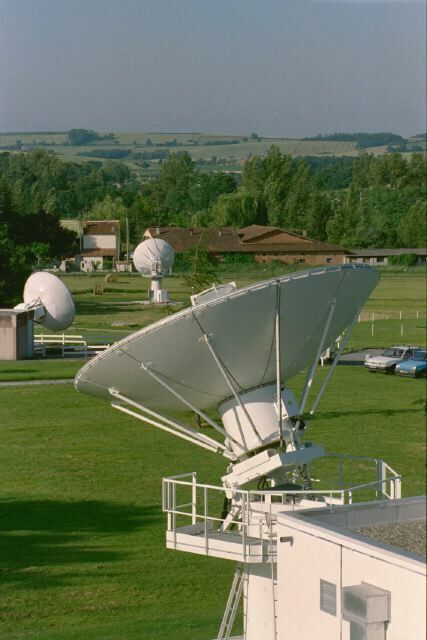 Teams of expert engineers on the ground communicate with a satellite by radio signals using large antennas at facilities called tracking stations. Their mission begins as soon as the satellite separates from the launcher—during the positioning phase—and continues throughout its service life, during which various stationkeeping operations need to be performed. Their main task is to locate the spacecraft, predict its trajectory, define operations and send manoeuvring commands. Au sol, des services spécialisés dialoguent par ondes radio avec le satellite au moyen de grandes antennes appelées stations de poursuite. Leur mission commence dès la séparation du satellite avec le lanceur – au cours de la mise à poste – et se poursuit tout au long de l’exploitation – durant le maintien à poste. Leur tâche essentielle consiste à localiser l’objet à partir de différentes mesures, prévoir sa trajectoire, déterminer les opérations nécessaires et lui communiquer les ordres de manœuvres. The satellite’s instruments and antennas are pointed precisely by rotating the spacecraft bus. Its attitude cannot be determined from the ground, so it also has sensors that measure its position with respect to the Sun, stars or a point on Earth. A lot of trajectory corrections are performed using the satellite’s chemical thrusters. The most important manoeuvres like circularizing the orbit require powerful thrusters, whereas finer positioning and stationkeeping manoeuvres rely on smaller motors. Consumption of propellant required for these operations is a key factor determining a satellite’s operational life: once it has spent all its fuel, it can no longer be controlled and therefore becomes inoperable. For this reason, new ion and plasma propulsion technologies are now increasingly finding favour. Not all trajectory corrections require propulsion, however. Interplanetary missions use “swing-by” manoeuvres—also called a gravity assist—that exploit the gravitational attraction of other stars or planets to modify a deep-space probe’s trajectory. For launches into low-Earth orbit, the launcher usually lofts the satellite into an initial orbit very close to the final mission orbit. 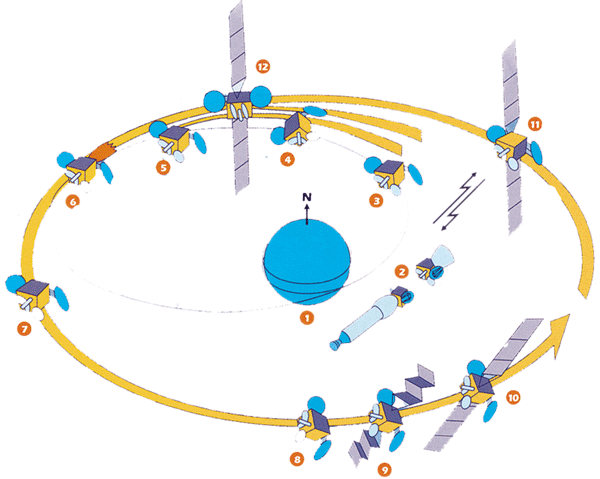 For a geostationary satellite, positioning operations are performed in several stages. Remember that a geostationary orbit is a circular orbit in the equatorial plane, at an altitude of about 36,000 km. The satellite is first injected into geostationary transfer orbit, where it spontaneously follows an elliptical trajectory; the apogee is near the final orbit altitude and the perigee at about 200 km. The orbit is then gradually circularized by 3 burns of the apogee kick motor, on 3 different passes at apogee. After being injected into an elliptical transfer orbit, the satellite circularizes its trajectory using its own thrusters. The apogee kick motor is fired on several passes at apogee, which is almost at the final orbital altitude, to bring the satellite gradually closer to its intended orbit on each pass. The transfer orbit is chosen so that it intersects the equatorial plane at apogee and perigee. The apogee kick motor is therefore pointed to deliver the thrust in the right direction to change the orbital plane. However, since the transfer orbit is not in the equatorial plane, its inclination cannot be lower than the latitude of the launch base. The satellite must therefore change its plane. Where the orbital plane intersects the equatorial plane, the satellite is oriented so that the thrust propels it in the right direction. Ground control teams then keep the satellite on station by making trajectory corrections every two weeks of so. A geostationary satellite’s orbital “slot” is a box a few tens of km on a side, corresponding to a latitude and longitude window on the Earth’s surface. A satellite will not stay in this slot if left alone, so it has to be manoeuvred from time to time to keep it on station. A satellite’s position inside its slot is known to within a few kilometres. The trajectory of an interplanetary probe is adjusted at the start of its mission, and then corrected at the midway point and several more times as it nears its destination. Given that manoeuvrability in space is limited, the only way for two spacecraft to rendezvous is to approach one another in the same plane, using carefully gauged and directed impulses. The target spacecraft, which may be a satellite or a space station, is usually already in a circular Earth orbit. For the two to be in the same plane, the launch base must be in the plane of the target when the second spacecraft lifts off. To get this coordination right with respect to the Earth’s rotation, the spacecraft must be launched within a window that lasts only a few minutes every day. The chasing spacecraft is injected into a lower, and therefore faster, circular orbit and has to perform a series of manoeuvres to close the gap. Once both spacecraft are in the same orbit, a further series of operations brings them together at a very low relative speed of about 1 cm/s. This closely controlled rendezvous technique is used to repair or even retrieve satellites. It also serves to ferry cargo and new elements for space station assembly. The first repair of an orbiting satellite was carried out in 1984. Using the US Space Shuttle Challenger's robot arm, astronauts were able to retrieve the satellite, which had failed in 1980, and place it in the shuttle's cargo bay. It was subsequently repaired and re-orbited 2 days later. Given that a satellite may be travelling at speeds up to 28,000 kph, the friction forces it is subjected to on re-entering Earth’s atmosphere cause it to burn up. Spent spacecraft and hardware are destroyed intentionally this way by allowing them to fall back to Earth. However, it is possible—and may indeed be vital—to bring a spacecraft back to Earth intact, by taking certain precautions. By 2005, the International Space Station (ISS) should be resupplied regularly by the European Automated Transfer Vehicle (ATV). The ATV will ferry food, oxygen and scientific equipment to the ISS. It will pick up waste and other spent objects for the return journey, during which it will burn up on re-entering the Earth’s atmosphere. This is a tricky operation that involves slowing the satellite, since it will remain in orbit for as long as its momentum is sustained by gravity alone. The satellite only needs to be slowed by 1% to de-orbit it so that it falls into the atmosphere. However, it must be brought back on a precise trajectory: if the inclination is either too high or too low, the satellite may burn up or bounce back into space. It must also be protected by a heatshield against the extreme heat generated during re-entry. It must also be protected by a heatshield against the extreme heat generated during re-entry. For a capsule, the engine is pointed forward and then fired so as to brake the spacecraft. The capsule separates from the spacecraft and re-enters the atmosphere. Its descent is then slowed by a parachute and it touches down automatically. For a space shuttle, the entire spacecraft returns to Earth. After performing a 180° braking turn, the shuttle re-establishes its normal attitude and re-enters the atmosphere in a nose-up, belly-first position. It then makes several turns before landing like an aircraft. The shuttle has to be piloted manually during the final stages of its flight.